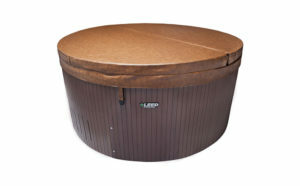 Hot tub covers are one of the most important energy saving aspects of your hot tub. Every Beachcomber cover is a heatshield that virtually locks in heat and energy. These covers are made in Canada for Canadian climates. Our covers are created to blend into your backyard environment and match your home décor and lifestyle. We stock sizes in Tan or Steel colours in both regular and opposite folds. A regular fold lid folds to the side when you’re standing facing the control panel. An opposite fold lid folds to the back when facing the control panel. 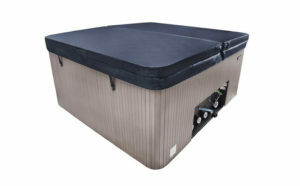 Beachcomber’s Heatshield Covers are built with twin access handles for the convenience of the hot tub owner. Both of these heavy-duty handles are hand sewn directly into the main seam structure of the secured outer band of the cover. This style of construction gives added strength and durability. This high-density foam is cut to exact specifications to fit tightly inside a vacuum-sealed polybag, maximizing heat retention. A high R-Factor of 14.14 per inch is achieved with Beachcomber’s Power Guard foam inner. This high-density foam locks heat in, and prevents the transfer of water in or out. 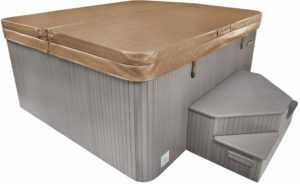 A 15-ounce double ply material for this bottom liner makes it moisture and mildew resistant. Composed of a Polyester Scrim, it maintains optimal strength and durability. Inside the outer edge of the hinge of each Beachcomber Heatshield is a hand sewn Superior Steam Sealer. These two small vinyl covered gaskets are added protection against heat loss, and found at both ends of the hinge. 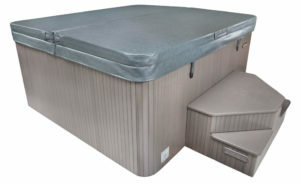 They prevent heat and steam from escaping, and maximize the heat retention capabilities of your Beachcomber Heatshield. 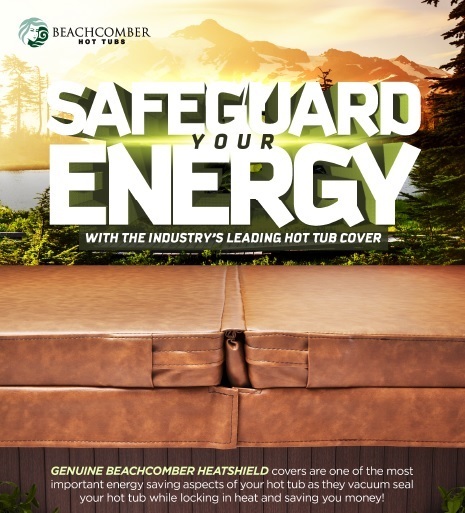 Every Beachcomber Heatshield Cover comes with a two-year Guarantee from the factory against defects in materials or workmanship. We stand behind our products. This is Beachcomber’s promise to our customers, that the Heatshield will perform as promised. Each foam insert for Beachcomber Heatshields are sealed from the factory in a heavy-duty poly bag. Using a vacuum sealer, air is pulled from the inserts to make it as air tight as possible. Each foam inner is trimmed on two corners at a six-inch radius. Once inserted, the inner seats itself securely into each corner for a very tight fit.